I received a lot of positive feedback and comments when I started the PMP Exam Tips series. So I decided to interview other successful PMP holders, who have passed their exam in the first attempt, and get them to share their strategies for preparing and passing the PMP Exam. These interviews are based on a Question and Answer format, so that you can find specific answers on the best study tips, Good strategy for the PMP Exam day, and general project management tips. The first interview of this series is with Raj Menon, PMP, CSM. Raj runs his own blog, and I’ve been following it for some time now. Thanks Raj for agreeing to share your thoughts on this important certification for Project Managers. Here goes… I have only edited for clarity sake, and added some links for your benefit. Q: What are your top 5-10 Tips or Suggestions that should help newbies aspiring for the PMP Credential? Get the PMPrepCast podcast and listen to it when you drive, workout – atleast 1 episode per day. Repeat the process at least twice. Read the PMBOK Guide at least once. I did it along with the podcast. Would read a chapter and then listen to the corresponding episodes or vice versa. Get a PMP Study Guide. I used Rita Mulcahy’s. Once I was done with the PMBOK guide in the 1st iteration with the the podcast, the second iteration is the podcast and Rita’s book. Take off from work or business or school, 2 weeks before the exam and attempt as many sample tests as possible. Memorize the formulas and practice creating the brain dump sheet every day of those 2 weeks. The evening before the exam, do a full 4 hours test and then go to sleep, wake up the next day and you will pass the test. Q: What suggestions would you give for attempting formula type questions from the EVM method in Cost Control? A: If you have the formulas memorized and before the exam you brain dump it to your rough sheet, there is nothing to worry about. You would have already practiced EVM type questions during your preparation. These are the questions you can easily score as they are straight forward. Don’t worry about them. Q: What would you list as your top 3 suggestions to be a Better Project Manager? A: Be Confident, Be Accountable and Respect Your Team. Q: What is a Good strategy for the Exam Day… and while attempting the PMP exam? A: Arrive at the exam center 1 hour ahead of time. Get in and register at least half hour before exam time (sometimes your test center will let you start your exam earlier). During the exam, make sure you use you headset or earplugs (which are provided usually) to block out any external noise – believe me, the will be noise. It is also a good idea to take at least one 5 mins interval or break – will help you refocus. It’s a long exam and the reason why I ask candidates to take a 4 hour full sample test the previous day, is so that you endure it at least once before exam day. 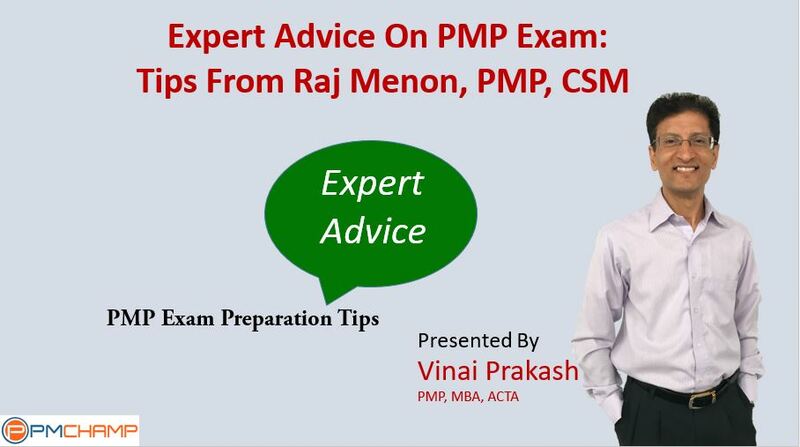 Hope you liked Raj’s tips on the PMP Exam. P.S. – You can get more such articles and tips delivered to your emailbox. Simply subscribe to the RSS Feed, and also get the PMP Tips Newsletter.